DatePicker Enables the user to select a date. FlipView Displays a collection of items, one item at a time. ListView Displays a collection of items in a grid or list layout. HtmlControl Displays an HTML page. Menu A menu flyout for displaying commands. Rating Lets the user rate an item. SemanticZoom Lets the user to zoom between two different views supplied by two child controls. One child control supplies the zoomed-out view and the other provides the zoomed-in view. SettingsFlyout Provides users with fast, in-context access to app settings. TimePicker Enables the user to select a time. ToggleSwitch Turns an item on or off. Tooltip Displays a tooltip that can support rich content (such as images and formatted text) to show more info about an object. ViewBox Scales a single child element to fill the available space without resizing it. The control reacts to changes in the size of the container, and to changes in size of the child element. For example, this control responds if a media query results in a change in aspect ratio. 1. Launch Visual Studio Express 2012 for Windows 8. 2. From the Start Page tab, click New Project. The New Project dialog box opens. 4. In the center pane, pick the Blank Application project template. 5. In the Name text box, enter a name for your project. 6. Click OK to create the project. This will take a moment. 1. Create a div element where you want to place the control. Set its data-win-control attribute to the fully qualified name of the control you want to create. This example creates a Rating control on the app’s start page (the default.html file). If you aren’t using the Blank Application template or if you’re adding the control to a page that you created yourself, you might need to add a call to WinJS.UI.processAll. If you added the control to your app’s home page (which is usually the default.html file), add a call to WinJS.UI.processAll in your onactivated event handler, as shown in the previous example. If you added the control to a Page control, you don’t need to add a call to WinJS.UI.processAll because the Page control does that for you automatically. If you added the control to another page that is not your app’s home page, handle the DOMContentLoaded event and use the handler to call WinJS.UI.processAll. Call the control’s addEventListener function and specify an event and an event handler. 1. In your HTML file, add a paragraph and give it an ID of “outputParagraph”. Your event listener will output to this paragraph. 1. 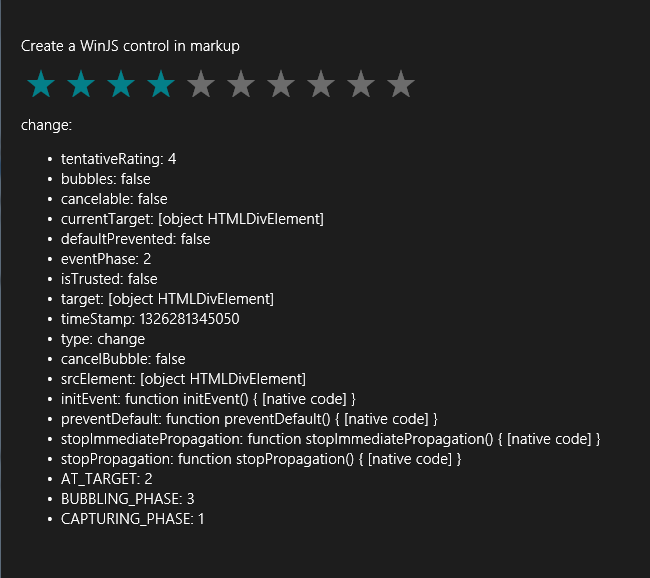 In your markup, create the element that will host your control. 2. In your code (preferably in your DOMContentLoaded event handler), retrieve the host element. Demonstrates the DatePicker and TimePicker controls. Demonstrates the WinJS.UI.ListView control, a control that displays data in a customizable list or grid. Hey, how do i get overall rating on an app ?